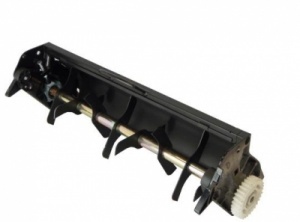 The Allett Lawn De-Thatcher Cartridge is designed to be used with the Allet cylinder mowers, making them an incredibly useful tool. Easy to fit, and very effective, the Dethatcher is designed to remove dense layers of thatch from your lawn, which improves the finish of your lawn and promotes growth. The wide spaced tines aggressively cut to a maximum depth of 6mm. Available in 3 sizes depending on the width of the machine - 14" 17" or 20"
Working Width: 14",17" or 20"